An end to species war? Workers at Hovis (Premier Foods) bakery in Wigan have voted to strike against the replacement of permanent workers with lower paid agency workers on zero-hours contracts. Workers will strike from 28 August to 4 September and further strikes are scheduled for 11-18 September and 25 September to 2 October. Workers who are organised by the BFAWU has already taken cuts in pay and working hours to avoid further redundancies. They voted 75% for strikes following abortive talks. The City of Bones is based on the first of The Mortal Instruments series of books by Cassandra Clare, and I was pleasantly surprised by the quality of the film adaptation. I was especially impressed by Lily Collins, who played Clary, the young female protagonist. Clary always thought she was just like everybody else until she started drawing a mysterious symbol. From there, everything she thought she knew is changed. 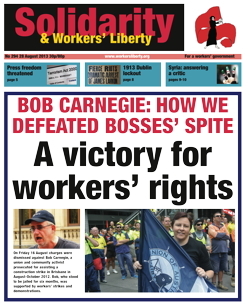 On Friday 16 August, contempt of court charges against Bob Carnegie, the Workers’ Liberty Australia member and union activist prosecuted for assisting a construction strike in Brisbane in August-October 2012, were dismissed. All the big construction sites in the centres of Brisbane had been shut by strikes, as they were on 11-13 February, when the case came to trial. 2,000 construction and other workers came to a solidarity demonstration at the Federal Court in Brisbane. Around 100 crammed into the courtroom and cheered when the judge announced the verdict. On 23 August 1927, two Italian-born anarchists were strapped into the electric chair in Boston, Massachusetts, USA, and electrocuted by order of the Mass. Supreme Court. They were Nicolo Sacco, a shoemaker, and Bartolomeo Vanzetti, a fish-pedlar. During the seven years they were in jail before their execution, the names of Sacco and Vanzetti became a byword in the US and international labour movement for ruling-class justice and the use of the courts to frame up and lynch rebel workers. On Sunday 18 August, David Miranda, the partner of Guardian journalist Glenn Greenwald, was detained for nine hours at Heathrow airport and questioned by police. His phone, computer and other electronic equipment was confiscated. He was not allowed access to a lawyer until the last hour of the questioning. The police told him he would be locked up if they thought he was “not co-operating”. Though many people in the media and online expressed surprise at Chelsea Manning’s announcement this week, a lot of us in the LGBT+ community have been aware that she is probably a trans woman for quite some time. Rumour was that she went by the name “Breanna”. Actually, Wired published speculation about Manning’s gender way back in 2010. The detention and interrogation of David Miranda at Heathrow airport on 18 August has proven quite a test for the British press. Nicos Anastasiadis, a teacher in northern Greece and a member of the socialist group DEA, talked to Solidarity. The federation of secondary school teachers’ unions has decided to strike at the beginning of September. We believe that we can create a spark to persuade all other unions to strike too. We will strike together with students and their parents. We need each others’ support and we must all fight together.